Love what you learn at Compliance Week West 2019? Want to access this information all year? 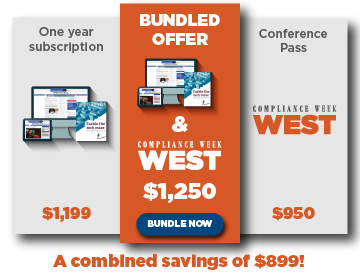 Attend Compliance Week West 2019 and subscribe to CW content online and in-print for the insights and resources you need to help protect your company, build value and prepare to succeed. Interested? Contact the CW Subscriptions team to learn more. Cancellation or substitution notice must be given by calling +1-888-519-9200 or by e-mail to conferences@complianceweek.com. Cancellations received on or before January 20, 2019, will incur a $250 cancellation fee. No refunds will be given after January 20, 2019. Substitute attendees will be permitted if notice is given by February 25, 2019. Attendees choosing to pay by invoice must pay prior to the start of the conference. No-shows to the conference are still liable for full payment.